Shhhh… Listen! Do You Hear The Sound Of Referral Marketing? Remember when you last visited a nearby restaurant, which was very good in terms of food, services etc. Now whenever you come across your friends, who are searching for a good food place, you will suggest the restaurant you’ve visited recently. This is what we call reference and this builds the concept of referral marketing, not only in restaurant’s case but in almost every business type. This is not a new concept as it is running from ages; one may get the idea from the example I’ve mentioned above. Referral marketing is thus defined as a process where a person aware of a good service will refer the same to his/her friends, family, colleague etc. This is sometimes due to goodwill and sometimes due to some benefit the referee is gaining from this strategy. Every new business startup faces a challenge of new idea with limited budget and hence they need a proper strategy to overcome all the obstacles and generate a ROI. It is quite obvious that when a new venture is started, promotional activities run on a high. Incorporating the referral marketing in your promotions will help one gain more customers. Affiliate marketing is solely an incentive based method where the affiliate being in traffic through their own efforts and company pays them according to the incentives prepared. Referral marketing is simply the reference made by current customers in his network and it may not always involve the benefits in terms of money or currency. Users may earn points, which may later be redeemed to earn some product of use. Keep it simple to involve more and more users in this program. This involves the usage of social media platforms like Facebook, Twitter etc. Referral marketing is not a short-term offer; it should carry a far-sighted approach to provide ling-term benefits to those who associate with the plan. For referral marketing to be successful a full-fledged team is required who will focus solely on this project from the sign-up till the incentives are fulfilled. For developing a lifetime connection, try to build new plans and offers for your loyalists. 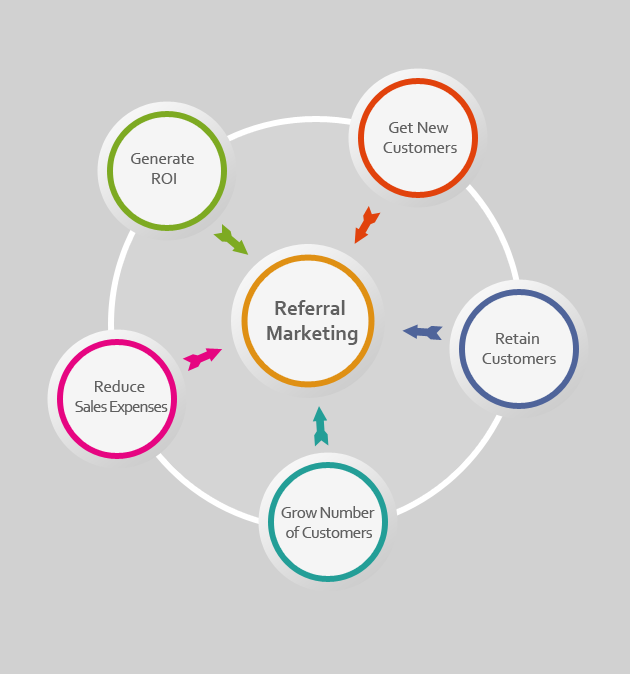 Referral marketing is an easy and quick way to develop your brand value through a long hierarchy of referrals. This is one of the easy and quick way to not only join more customers but also build ROI. Share your views in comment box below. We’d love to hear from you!